It's very hot at the moment. That's my only reason and excuse for posting some extracts of summer poetry from the Old English poem The Phoenix, in which an Anglo-Saxon poet who must have been a bit of a sun-worshipper comes up with a dazzling array of metaphors for the 'candle of the heavens' which burns so fiercely above us. 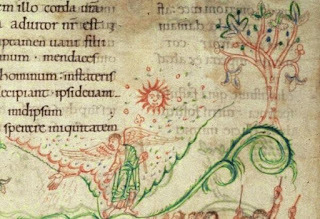 This poem, which survives in the tenth-century Exeter Book, is based on a Latin source and describes the legend of the regenerating phoenix. 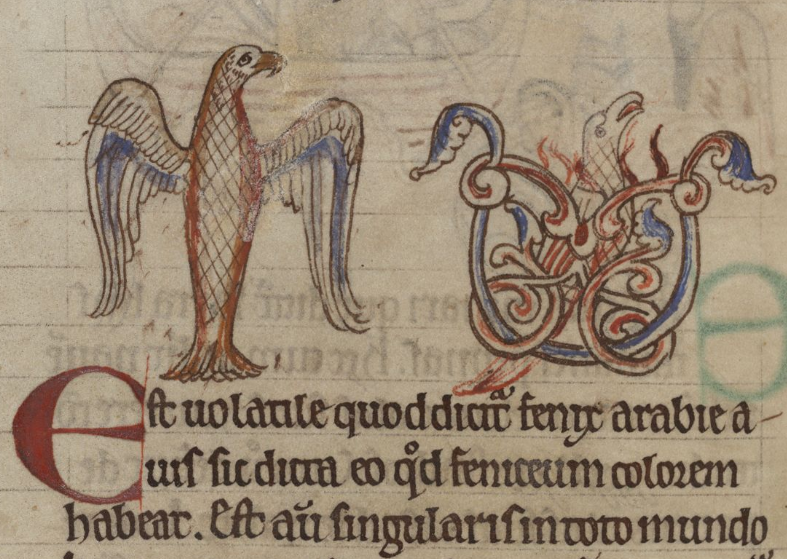 As was common in medieval thought about the phoenix, the story is interpreted as an allegory of Christ's resurrection and the rebirth of the redeemed human soul. You can read a translation of the whole poem here (the translation in this post is my own). 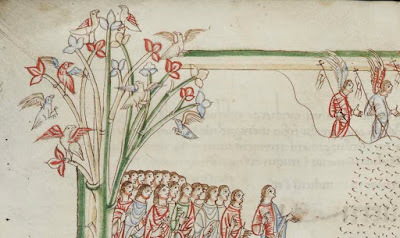 The phoenix is imagined as living in a natural landscape of glorious beauty, which means the poem itself, to keep pace, becomes elaborately ornamented and richly beautiful in its language. The language of this poem is not easy, but it contains some of the loveliest nature writing in Old English - Anglo-Saxon poets were pretty adept at describing wintry scenes, and could probably compose word-sketches of stormy seas and hail-scarred cliffs in their sleep, but this poet, for a change, gets to do some lovely things with sunshine and leaf-shade and the full-blown radiance of summer. grene stondað, swa him god bibead. ever green, as God commanded them. Look at all those poetic phrases for the sun, packed into just seven lines: God's candle, jewel of gladness, the noblest of stars... I've written before about how another Anglo-Saxon poet used the image of the sun as a jewel, rising to its highest at the summer solstice, to evoke the Son himself, the ascended Christ; and since the phoenix's resurrection analogises Christ's, perhaps that should be in the back of the reader's mind here too. Both might be called the 'Father's ancient work, the bright token of God'. 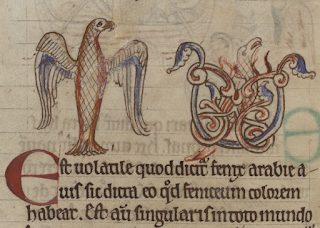 Fenix on foldan, of þæs fugles noman. wunað ungewyrded, þenden woruld stondeð. call 'Phoenix', from that bird's name. abiding untouched, as long as the world stands. 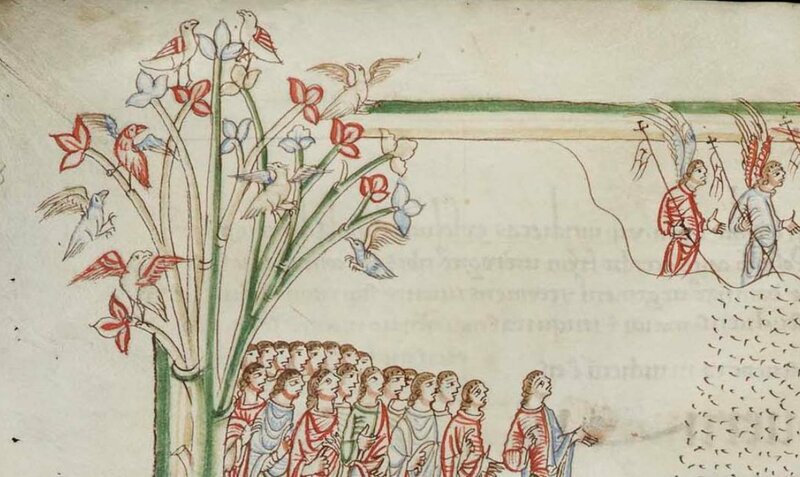 So too its steadfastness, standing 'as long as the world stands': to stand is the characteristic of the cross, the tree which is the still point of the turning world, the axis of the universe, the world-tree. ond þam æþelestum eorþan bledum. hus onhæted þurh hador swegl. is heated by the brilliant radiance. As the blazing sun of our present heatwave scorches the ground, drying the leaves to dust and turning the grass yellow, it lays bare to the eye the process this poet is describing: summer turning into harvest, as the year begins to die like the phoenix. It's almost Lammas, after all, and autumn is less than a month away - time to be harvesting.